D-module theory is essentially the algebraic study of systems of linear partial differential equations. 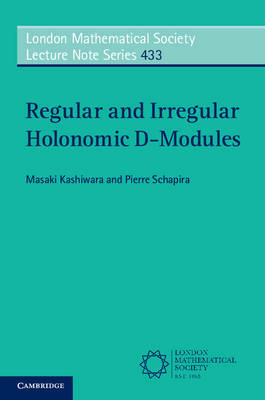 This book, the first devoted specifically to holonomic D-modules, provides a unified treatment of both regular and irregular D-modules. The authors begin by recalling the main results of the theory of indsheaves and subanalytic sheaves, explaining in detail the operations on D-modules and their tempered holomorphic solutions. As an application, they obtain the Riemann-Hilbert correspondence for regular holonomic D-modules. In the second part of the book the authors do the same for the sheaf of enhanced tempered solutions of (not necessarily regular) holonomic D-modules. Originating from a series of lectures given at the Institut des Hautes Études Scientifiques in Paris, this book is addressed to graduate students and researchers familiar with the language of sheaves and D-modules, in the derived sense.